Recently my family and I were whisked back in time 7,000 years when visiting Lava Lands, part of Central Oregon’s Newberry National Volcanic Monument in the Deschutes National Forest. That’s when Lava Butte erupted and engulfed miles of surrounding forest and wildlife with layers of molten lava. Today, visitors of all ages can explore the volcanic landscapes in this scenic area. Created when a volcanic vent erupted, Lava Butte is a cinder cone, elevation 5,020 feet. Drive the 1.75-mile paved road to the top and enjoy wide-angle views of the remains of Mt. Newberry and the surrounding lava fields from the observation tower. If time permits, circle the butte’s 60-foot crater on the .25-mile unpaved Lava Butte Rim Trail. Due to limited parking at the butte, 30 minute parking passes are issued on a first come, first serve basis. (On busy days there may be a wait.) Passes are available at the main entrance. Located at the base of Lava Butte, the visitor center is filled with interactive displays, topographic maps, and educational films about the area’s cultural and volcanic history. There’s also an on-site bookstore offering maps, brochures and souvenirs. Ranger-guided walks are offered twice daily. 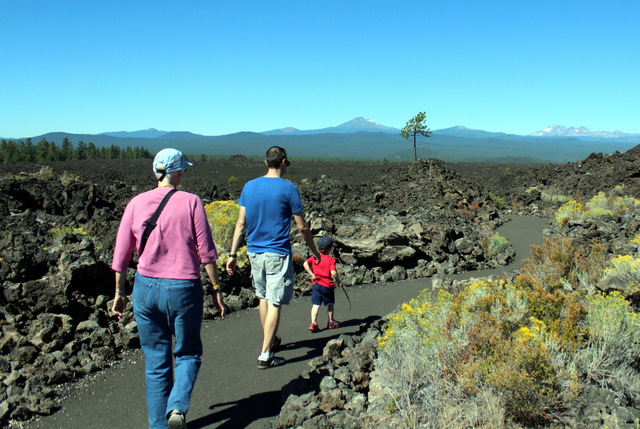 Afterward exploring the visitor center, my husband, our four-year-old son, my mother-in-law, and I walked the Trail of Molten Land, a one-mile, self-guided loop that meanders through the millennia-old lava flow. Lava Lands Visitor Center is open most days May through early October. There’s a nominal fee per vehicle to enter. To plan a trip to Central Oregon, visit the Central Oregon Visitors Association. This originally version of this post was published in the September/October 2014 issue of Northwest Travel Magazine.